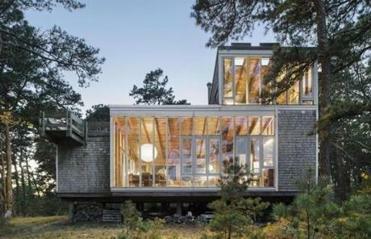 Charles Zehnder’s Kugel/Gips House in Wellfleet, built in 1970. Excerpted from the book “Cape Cod Modern: Midcentury Architecture and Community on the outer Cape” by Peter McMahon and Christine Cipriani. Five thousand years from now, Cape Cod will be gone. Humans were late arrivals to this rugged curl of land south of Boston, and we came just in time. The Cape was dragged into being just 1,800 years ago, near the end of the most recent Ice Age. The northward retreat of the giant Laurentide Ice Sheet left a graceful, arm-shaped edge of sand, gravel, clay, and rock surrounded by rising salt water. The highest ridge of that pile of debris, the glacial moraine, now forms a topographical backbone down the Cape, surrounded by outwash plains that slope westward into Cape Cod Bay. Lingering ice boulders, standing firm as meltwaters deposited land around them, eventually melted into deep puddles known as kettle ponds — now some of the loveliest, most secluded settings on outer Cape Cod. Since that time, Atlantic waves and currents have been pounding the Cape’s outer shore in oblique, wind-blown patterns, steadily eroding the beach and pushing enough sand northward to create all of Provincetown and its harbor. Even the otherworldly dunes of the Province Lands, cherished by generations of painters, writers, and photographers, are a flash in the pan of geological time: Formed by the displacement of sandy points south, they were woodlands just a few hundred years ago. Humanity’s appetite for lumber scraped them into bare dunes, which had to be manually replanted to keep the drifting sand from smothering Provincetown. The land is in endless flux. And the sea has never stopped rising. Architecture on Cape Cod has always been imbued with this sense of impermanence. Every type of building here — domestic, commercial, maritime, holiday — has an element of the ephemeral. Buildings near the water were often set on pilings, or stilts, to avoid being crushed or soaked by the weather; in a storm, water, snow, or sand would swirl under and around the building rather than drift against it. In the 20th century, attitudes toward the shore began to shift from fear to excitement, and many fish houses, dune shacks, and lifesaving stations were repurposed and prized by creative people for their very closeness to nature. Many were, in turn, poetically lost to the sea. Cape Cod’s most famous house type, the snug, harmonious Cape, was built to last. It was an English house — simple, practical, and handsome. A Cape was not easily ruined — but it could be moved. When the ocean encroached on a neighborhood, or business called from the harbor, owners would lift, roll, and float these steadfast abodes from one part of town to another. Complicating their pedigrees, many early houses were built or expanded with recycled lumber from different times and places. Go back far enough and the bones of every house on Cape Cod hold multiple stories. An old building may be historic, but it probably wasn’t original to the period. When the Modernists arrive, they will build on these traditions of enterprise, flexibility, and economy, often consciously borrowing elements of Cape Cod’s vernaculars that typify Modern ideals. Wampanoag wetus, classic Capes, dune shacks, huts of refuge, and maritime sheds on pilings were all framed structures with a skin. They wore their locally available, often secondhand materials honestly, achieving a handsome profile with little or no adornment. They sat lightly on the land, with little or no foundational footprint, and were sited to interact with nature in the most respectfuly way — sometimes to their benefit, sometimes to their detriment. While outer Cape Cod’s contributions to 20th-century art, theater, and literature are well known, its profusion of midcentury architecture has gone mostly unnoticed. Ironically, this was somewhat deliberate. These Modern houses are the opposite of monumental, often comprising less than a thousand square feet. Most are hidden in the woods. Even so, most are introverted on the approach, peering at guests from high ribbon windows while bursting open to the landscape in back. Their designers initially had no clients; they built for themselves and their families, or for friends sympathetic to their goals. Their summer homes were laboratories, thought experiments, places to revisit problems and work through ideas without spending much money. These Modernists were not iconoclasts, exactly: They took cues from Colonial cottages and fishing shacks, including the classic pitched-roof cottage now known universally as a Cape. Borrowing from traditional materials (such as cedar siding), methods, and precepts, they fashioned basic lumberyard materials into new designs that solved genuine problems. Whereas earlier builders set Capes in vales and hollows for shelter from the elements, many Modernists built on mounds — and lifted their houses on pilings — to leave the land untouched while capturing light, breezes, and views. By the 1960s, younger architects were collaborating with the masters, establishing their own practices, and evolving the new vernacular as the aims and forms of Modern architecture itself widened beyond their origins. The result of this ferment is a body of work unlike any other, a regional Modernism that fused Bauhaus ideals and postwar innovations with the building traditions of Cape Cod fishing towns. Many of these designers came of age around World War II, when building commissions were few. They earned a living in either academia or carpentry. Out of both necessity and ideology, they wanted to create affordable housing for a growing population. Accordingly, on the Cape, they used inexpensive, off-the-shelf materials such as plate glass and Homasote, the first and only construction material made from recycled paper. Some designers, like their thrifty Colonial forebears, used salvaged materials; and some used no glazed windows at all, only screens. The results were almost temporary in their construction. Cottage decor was informal — walls were hung with original artwork by owners’ friends, and rooms could be stocked with butterfly or Windsor chairs, whatever was affordable and functional. Kitchens were small and utilitarian, an afterthought to the indoor-outdoor gathering space. This ad hoc, improvisational quality is what sets Cape Cod Modernism apart from other regional adaptations of the Modern movement. Many of these houses were thrown together with whatever materials were handy, from 18th-century bricks and beams to entire abandoned structures such as Army barracks or a water tower. If the property held an old house or cabin, most designers simply grafted a Modern house onto it, forming a permanent hybrid. Because most designed their first Cape Cod house for themselves, they relished the freedom to take risks and sometimes to fail — as one architect did with a magnificent fireplace that filled his living room with smoke. And, like the traditional Cape, the Modern houses were repeatedly modified and enlarged to suit their owners’ changing needs and means. Ultimately, it was the designers’ talented guests and clients who made their community a destination: the Gropiuses, who stayed early and often with the Breuers and Chermayeffs; three generations of the Saarinen family; Florence and Hans Knoll; Surrealist painters Arshile Gorky and Max Ernst, and Ernst’s wife, the art collector Peggy Guggenheim; New Yorker cartoonist Saul Steinberg and writer Dwight Macdonald; historian Arthur Schlesinger Jr.; and countless others. Many designers worked until 4 or 5 p.m., then repaired to one another’s houses for martinis, salami, and Triscuits. And in the quiet summers of the 1940s, their Saturday night bonfires on Newcomb Hollow Beach led to more love affairs than will ever be documented. Excerpted from “Cape Cod Modern: Midcentury Architecture and Community on the Outer Cape,” published in July by Metropolis Books. Copyright © 2014 by Peter McMahon and Christine Cipriani. All rights reserved. Send comments to Address@globe.com.